Julie Blanchong, an associate professor of natural resource ecology and management, said the recent confirmation of chronic wasting disease in Dubuque County means the disease has turned up in wild deer in four Iowa counties in recent years. The neurological disorder arises from misfolded proteins, called prions, that affect the brain. In North America, the disease affects white-tailed deer, mule deer, elk and moose and is always fatal. However, there’s no evidence that humans can contract the disease. Still, hunters who suspect they’ve harvested a deer with chronic wasting disease should have the carcass tested, and the Centers for Disease Control and Prevention urge against the consumption of venison from infected deer. Symptoms in infected deer include severe weight loss, as well as stumbling and disorientation. However, visible symptoms may take a year and a half or longer to appear. Blanchong said the disease spreads from one deer to another via physical contact and through secretions such as saliva, blood, feces and urine. Secretions that contain infected prions can contaminate the environment for lengthy periods of time and facilitate transmission of the disease, she added. Blanchong said the disease poses a major challenge for conservation and natural resource agencies, and no surefire strategy has emerged to control it. There’s currently no treatment or vaccine, she said. She pointed to some localized areas in Wisconsin where testing reveals almost 50 percent of adult males are likely infected with the disease. Blanchong said deer can cover a lot of ground in a single lifetime, which further complicates managing the disease. Variables such as availability of habitat, the presence of roads or waterways and other factors can influence how far deer travel, she said. Males typically disperse while females remain close to where they are born, she said, though that’s not always the case. A male usually travels somewhere between 5 and 10 kilometers away from the area where it was born roughly a year and a half after birth, but distances can sometimes be much greater. Then, the deer will usually live the remainder of its life in that general area. Despite the challenges, efforts to prevent, contain and control chronic wasting disease are important because the disease could have a range of long-term ecological effects that impact humans, even if humans can’t contract the disease, she said. The disease could result in declines in a local deer population, which may require changes to hunting and conservation practices. Steep long-term declines in deer populations could disrupt food chains in some ecosystems as well. Blanchong also noted the possibility that public concerns related to chronic wasting disease could reduce hunting, an important tool in controlling deer populations. In addition to the recent confirmation of chronic wasting disease in a deer in Dubuque County, previous confirmations have been made in Allamakee and Clayton counties in northeast Iowa and Wayne County in southern Iowa. 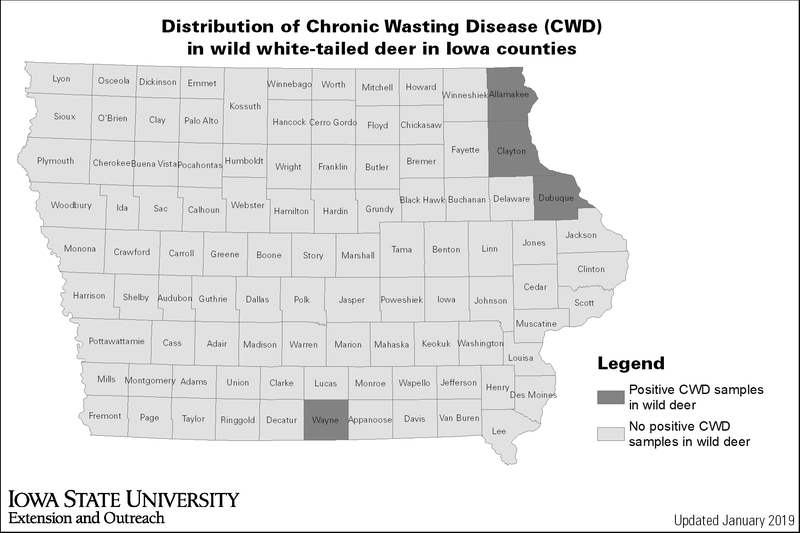 Iowa State University Extension and Outreach maintains a website with updated information on chronic wasting disease in the state. Confirmed cases of chronic wasting disease have shown up in Allamakee, Clayton, Dubuque and Wayne counties in Iowa. Image courtesy of Iowa State University Extension and Outreach. Larger image. An ISU wildlife ecologist looks at the future of chronic wasting disease in Iowa deer after the recent confirmation of a case in Dubuque County. Chronic wasting disease, a neurological disorder that arises from misfolded proteins that affect the brains of deer, has been confirmed in four Iowa counties. There’s no evidence humans can contract the disease, but hunters are urged to have harvested deer tested if they suspect the disease is present, and no one should eat venison from infected deer.